Home > Features > Has the influx of foreign players made Arsenal a more successful side? Has the influx of foreign players made Arsenal a more successful side? 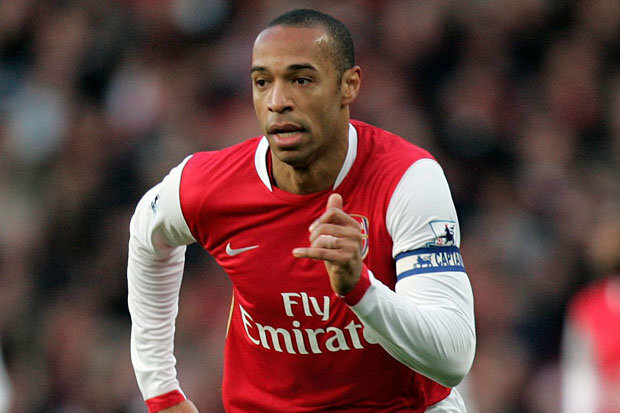 Arsenal fans have enjoyed watching some of the best foreign players in the Premier League over the past 20 years but is there a direct correlation between foreigners in the team and the number of titles we’ve won? Let’s take a look…. The guys at Casumo casino have looked through the data and they’ve compiled an interesting graphic that details the percentage of English players that played for the club from the 1950’s right through to the present day. The graphic then goes a step further to show the percentage for other areas such as Ireland, continental Europe, the Americas, Africa and Asia, and noting which years we won the title. Back in 1950 every single Arsenal player was born in England and we won our seventh league title in 1953. During the following decade the percentage of English players steadily declined as players from Scotland, Europe, America and Ireland made their way to north London. By 1960, the percentage of English players playing for Arsenal was down to around 60% with 80% coming from England, Wales or Scotland. The numbers actually rose during the 60’s as players from Ireland and the Americas departed meaning by 1970, 88% of Arsenal’s squad were from England, Wales or Scotland with the remaining 12% hailing from Europe and we ended a 16-year wait for the title b lifting the trophy in 1971. The mid-70’s saw a sharp decline in the number of English players plying their trade at Arsenal as the percentage of English players dropped below 50 as we had a large influx of men coming from the Republic of Ireland. In 1980, 71% of players were from England, Wales or Scotland as we saw the first Asian players arriving at the club. During the 80’s we saw the number of English players join the club as the percentage rose towards the 80 percentile again with the Scottish and European contingent diminishing. By 1990, the percentage of players from England, Wales or Scotland was back up to 84% with the vast majority being English and we won two titles under George Graham in 1989 and 1991 with a sold English backbone. 1995 was a huge year, not just for Arsenal but for the entire footballing world as the Bosman Ruling was introduced which reduced the barriers for European player transfers. Arsene Wenger also arrived shortly after to become the Arsenal manager in 1996 and it’s no surprise that we saw a huge influx of players coming to the club from all around the world. Wenger was known for his astute purchases in the transfer market and he knew the French market like nobody else. The likes of Dennis Bergkamp, Patrick Vieira, Emmanuel Petit and Nicolas Anelka all arrived to boost our European contingent while we also started to see a growing number of African players joining the club. Wenger’s arrival brought huge success as he won the Premier League title in 1997/98 and while he inherited the famous back five [all English] which included the likes of David Seaman, Nigel Winterburn, Lee Dixon, Tony Adams and Steve Bould, the number of English/Welsh/Scottish players at the club plummeted to just 42% by the year 2000. European players, mainly French and Dutch, were becoming just as dominant as English players but that didn’t seem to affect our chances of winning titles as Wenger led us to further Premier League titles in 2002 and 2004. The 2004 campaign was particularly memorable as it was the year we won the league without losing a single game becoming ‘invincible’. The team still has a strong English core with Ashley Cole, Martin Keown, Sol Campbell and Ray Parlour all key players but Frenchman Thierry Henry, Vieira, Robert Pires and Sylvain Wiltord were also integral to the starting eleven while other European players such as Bergkamp, Freddie Ljunberg and Jens Lehmann boosted the European contingent. Kolo Toure, Kanu and Lauren all came from Africa while Gilberto Silva and Edu hailed from Brazil so it was certainly a side that was multicultural and our greatest ever team was compiled from players all over the world. 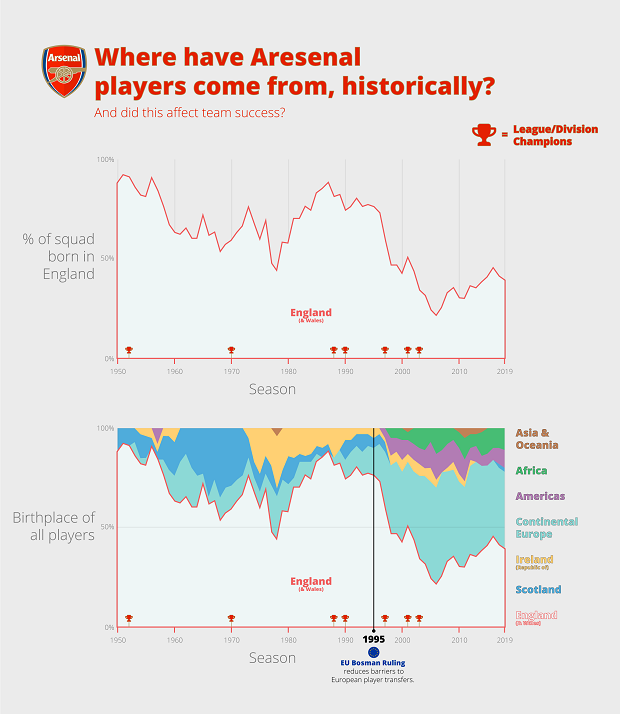 By 2010, just 30% of the Arsenal squad was from England, Scotland or Wales with Europe now the main player with 43%. Unfortunately, the move from Highbury to the Emirates Stadium in 2006 saw us become less competitive on the field. Key foreign players left and Wenger tried to re-build his ‘British core’ which has resulted in an increase in the number of English players at the club but sadly we couldn’t compete for major titles anymore and we haven’t won the league since the invincibles in 2004. There is little doubt that the influx of foreign players made Arsenal a MUCH better side during the late 90’s and early 2000’s but we were still an excellent unit in the late 80’s early 90’s when we has around 80% of the squad being English. I think foreign players have made all clubs better but it’s still important to have an strong British core.